At San Diego Comic-Con more information was released on the upcoming Avengers 4 movie: Infinity Wars. This includes the first footage, which was exhibited for audiences at the Comic Con. 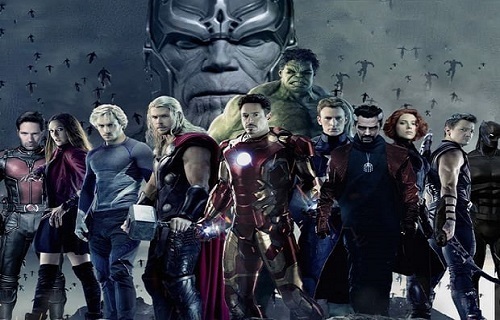 We are already aware of the almighty scale of Marvel’s picture, which combines the established Avengers with the wider Marvel cinematic universes of Dr Strange and Guardians of the Galaxy. Some of the character additions that debuted in Civil War are also turning including Spider-Man and Black Panther. Thanos is the central antagonist and his Black Order will be serving the titan’s wishes. The new footage opens up with the Guardians in the Galaxy team in Mantis and Teenage Groot, who have a run in literally with Thor. The god of thunder’s brother Loki is seen visibly handing over the tesseract to an unknown figure, possibly Thanos. Fans obviously want to glimpse their favorite super heroes in the thick of the action and there were brief exerts of some action scenes. Dr Strange and the Guardians team are depicted battling with Thanos. We know that Tony Stark/ Iron Man embarks on his own journey into space and hooks up with Star-Lord, Gamora and the gang. Spider-Man complete with new suit and Black Panther are also gearing up for the epic struggle ahead. A bearded Steve Rodgers/ Captain America is joining the action, but he will need to bury the hatchet with Tony Stark first. Thanos is determined to unite the Infinity Stones. The infinity stones have already been teased in earlier Marvel cinematic outings. Loki’s scepter in the Avengers is housing the Mind Stone, the Reality Stone showed up in Thor: The Dark World, the Space Stone was the Tesseract in Captain America. While Guardians of the Galaxy and Doctor Strange featured the Power Stone and the Time Stone. The Infinity Gauntlet designed to hold the stones has also deliberately been displayed.